tomorrow is my birthday. you best bet i was doing a happy dance that brody was born on 19th and not the 21st. no child of mine is gonna rain on my parade and take my birthday away. who am i kidding? two days before is still taking it. 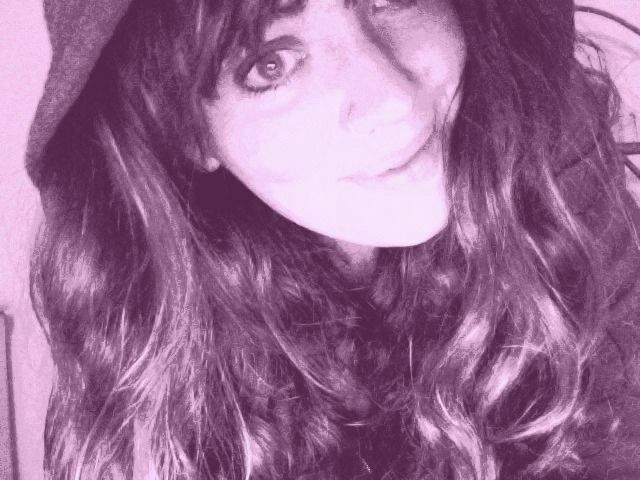 whatevs. i made a list of twenty five things i'd like to do in my 25th year. i could add many more things to it but i guess that would take away the idea of 25 things for my 25th year, wouldn't it? just one more… eat more ice cream. also, i added some things to the list i knew i was going to do already to be sure i could check them off. i love checking things off. i am santa claus in another life. tomorrow i have something fabulous to share with you. happy birthday a day early, danielle!! (well two days early because here in kansas it's still tuesday at 11:15p.m.). you will get your card late cuz that's how i roll. i dig your 25 list. i guess since i'm coming up on 30 i should make one too. hmm. i could apply so many of these to my own "next year"! I have an idea on how to put 5 & 12 together if you're up for it. Lets talk. Happy Happy Almost Birthday:) Mine is the day after yours...wahoo!!!!!!!!!!! I love how you put "debate getting a tattoo" rather then "get a tattoo"!!! Lol! Happy Birthday, as a fellow April baby, I wish you the bestest birthday and that it doesn't rain! you should see my to-do list...i draw boxes in front so i can check it off when i'm done. and if i did something that wasn't on the list, i add it just to check it off. i understand your love of check lists! YAY! Almost your birthday! SO fun! p.s. I totally add things to a to-do list that I know that I am doing for sure or have already done so that I can mark them off! p.s.s. I starting reading one thousand gifts last night. Thanks for sharing...it's uh-mazing & I've only read 2 chapters! And I love your list! Excited about your big day tomorrow! Hope it's awesome! me and miles are two days apart as well. i kinda feel like his first bday is raining on my 30th. rude. it rained on my 29th also. cuzzzzzzz who wants to be a whale. Love it! And I also love how that picture of you is 80% hair. Love your blog, looking forward to following along! hooray for birthdays! aren't they the best? 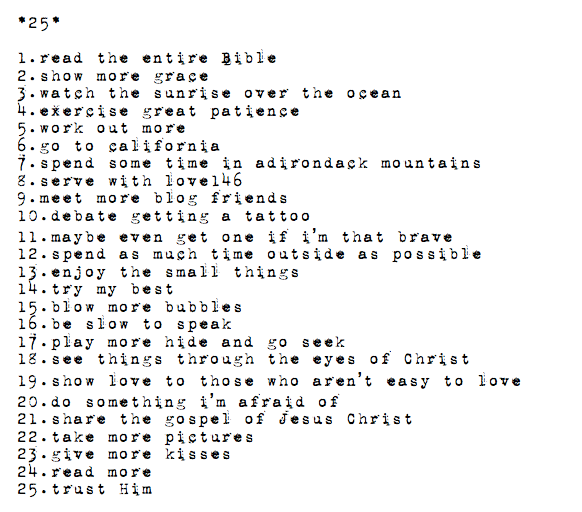 :) i love your list... "show more grace" is one of the goals of my 25th year too. we talk so much about receiving His grace and goodness, but i want to BE grace. i want to give it out in droves, because that's what He does for me. love your photo! Great edit! and HAPPY BIRTHDAY!!! meep!! happy birthday, cutie pants! great list! you are a champion. love your list, my friend! Love your list! You mentioned the Adirondacks - have you ever been to/heard of Camp-of-the-Woods in Speculator, NY? It's a Christian family camp. I grew up spending my summers there with my family - AMAZING memories. Some of my very best memories. True story. Have the happiest of birthdays!! Happy Happy Birthday. I am a new reader of your blog and love it...a link sits on my bookmark bar so I can take a peak everyday. Thanks for you sweet outlook on life!